When talking about Kobe Beef, we must not forget the role of the farms that rear these cows. Behind the title “Champion Cow” awarded to prize-winning cattle at the “Kyorei Kai” cattle show held at the end of every year are the untiring efforts of veteran farmers who really should be called “craftsmen cattle rearers.” The Kyorei Kai is the main event of the year where farmers can be recognized and rewarded for their hard efforts. 100 Hyogo Prefecture produce Tajima-gyu are put on show here and awarded medals including the Distinction Award and Best of Show. 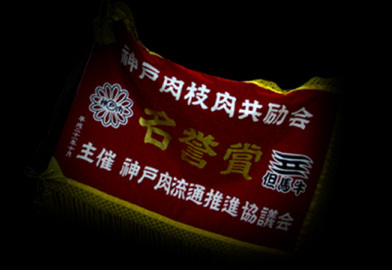 Producers awarded the Distinction Award are also presented with a pennant. Here is the first in a series of introductory articles about producers who have been awarded this prestigious prize. Here, in this series, we would like to introduce the winner of Honorary Prize in the biggest carcass competition of the year.